You must be a member of the Cologne Jazz Group to attend this activity. Would you like to join this group? From the begin­ning of jazz, Cle­mens Orth has been using exter­nal musi­cal influ­en­ces to set new accents and to con­nect see­min­gly dis­tant musi­cal points with his impro­vi­sa­ti­ons. When tal­king with Orth, the pia­nist, about his work, one quickly rea­li­ses that he much pre­fers this hori­zon­tal aspect of music. 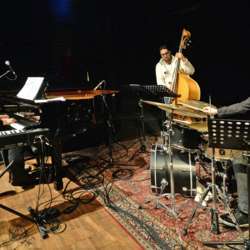 Wit­hout lea­ving the inter­nal space of jazz, his melo­dics unfold a colour­ful world full of inspi­ra­tion and sur­pri­ses which is per­fectly com­ple­men­ted by Sam Minaie on the bass and Ross Pederson on the drums. In his often quite exten­ded piano intros, Orth demons­tra­tes his affi­nity to ele­giac free impro­vi­sa­tion and his love of impressionism.